I was trying to decide what kind of special fixed gear bicycle I would build to fuel my passion for that smooth, quiet and peaceful rush I get when momentum takes its course. I became interested in staying with a classic design but built with modern components or, as one might call it, "new old-timey" components. I started seeing pictures of some of Peter Weigle's impossibly beautiful work and spoke with him about my objectives. He happened to have, in my size, one of his 1980 frames (received from the original customer who hardly used it) for which Peter had just built a new fork, intended for rack and fender mounting, with a rake for randonneuring. For me, it was clear I was having one of those in-the-right-place-at-the-right-time moments so I committed to that frame. 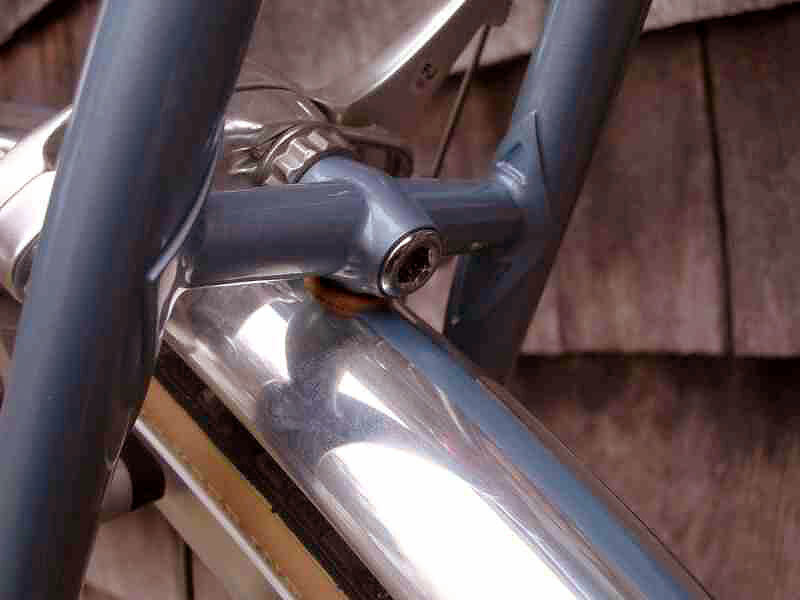 For this project, Peter fabricated and nickel plated a new front rack, removed all of the drive train braze-ons (kept the rear derailleur hanger to be able to gear up the bike with clips, if desired), nickel plated the Campagnolo dropouts, brazed a pump peg onto the down tube, elegantly mounted Honjo fenders (shaved and shaped the tips of the fender stays) and mounted one of his signature rear lights on the back of the seat tube. Around this time, Bicycle Quarterly's then current issue had an article of a 1950 Rene Herse fixed-gear winter training bike that provided a bit of inspiration for the direction we were already heading. The lugs are simple but very fine so I wanted a paint scheme that was understated. The solid paint is a Seascape blue with a color coordinated stripe along the fenders. Peter used vintage decals on the down tube that are smaller than current font size and on the seat tube that is marked from "East Haddam". For a bunch of reasons I wanted to stick with current production stuff but keep that "new old-timey" look. So the bike is sporting mostly all new and easily available components from Brooks, Campagnolo, Cinelli, DT Swiss, Mavic, Nitto, Panaracer, Phil Wood, Salsa, Shimano, Silca, Velox and Wipperman. 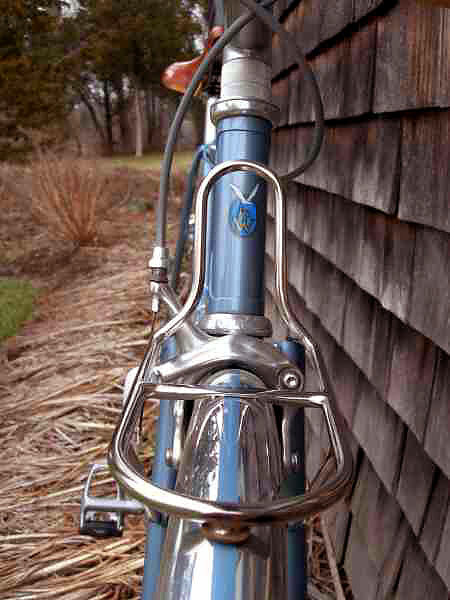 The only NOS stuff are (i) a Campagnolo stainless steel pump head and (ii) a Campagnolo seat post binder bolt. On component selection, I am certain this bike would look better with MKS Royal Nuevo pedals and Cinelli Binda toe straps however I like a more positive connection to my wheels with the fixed gear drive train. 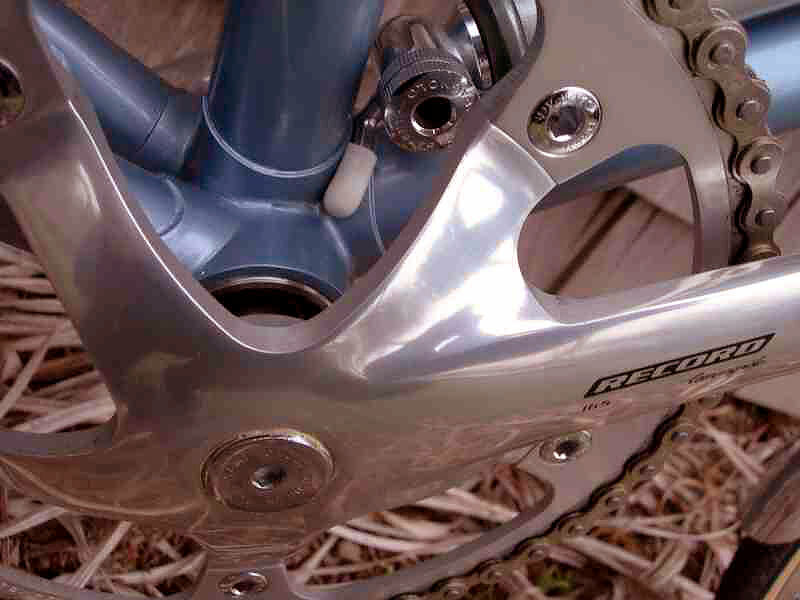 Oh, and the rear brake, that's for my wife. 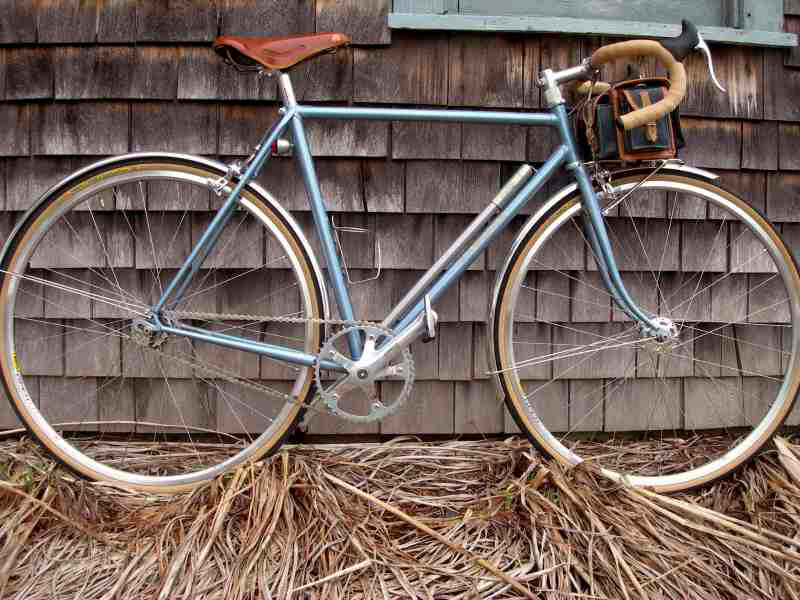 The wheels (which are great) were built up, and the bike was assembled, by Clarke White in Essex, Connecticut. Clarke did exactly what he said he would, when he said he would and for the price he said he would - which, in my experience, is difficult to find at a LBS. The entire build is tight and truly buttoned up - Clarke nailed a perfectly straight chain line (facilitated by the adjustable Phil bottom bracket). He's a veteran with range - lots of knowledge and experience from vintage stuff to carbon bits. Before I attached my pedals and mounted the bag, Clarke weighed the bike in at 20 pounds. 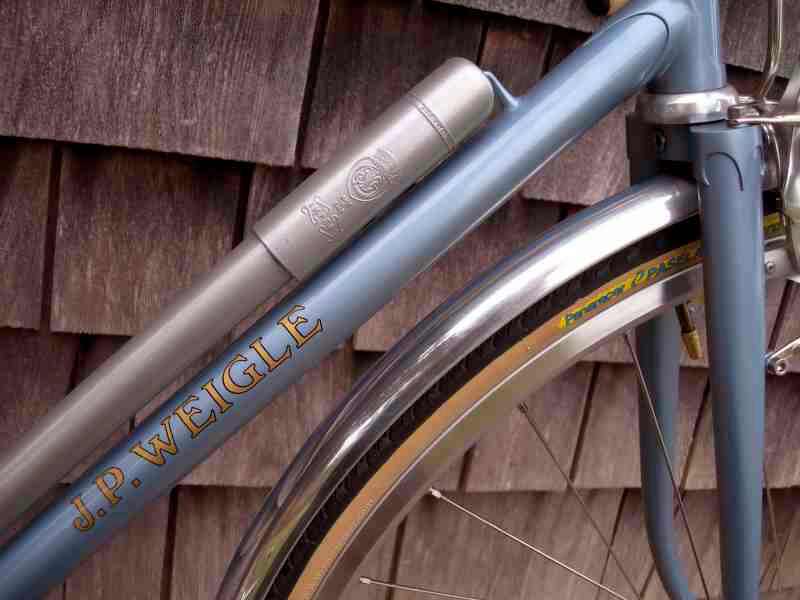 This Weigle path racer for me is as close to an Aston Martin as a bicycle can get in both aesthetics and ride quality. I feel my new ride to be incredibly smooth AND agile, comfortable AND fast, elegant AND performance oriented. Riding this bicycle makes me smile for every little moment. It tracks like a meteorite - I can use both hands at once to pull up my leg warmers while pedaling (remember, fixed gear) without any course deviation. It has an extremely stable AND responsive front end whether riding with just a small saddle bag or the fully loaded Gilles Berthoud bag - the carrying capacity of the "handlebar" bag enables me to pack for long, unpredictable rides providing a sense of unstoppable freedom on the road. With a 27-year old Weigle frame feeling this good and moving this well I am trying to fathom how much more special a modern day, brand new and custom fit Weigle would be. Peter Weigle is a master of the randonneur and, in my opinion, is currently carving the most tastefully exquisite lugs around. Peter is absolutely brimming with subtlety, humility and integrity. He is a pleasure to deal with and I truly appreciate his patience with me and my project - there is so much I learned from him in this process. With people like Peter Weigle in the game, it is no wonder that we are experiencing a new golden age of hand built bicycles.